The Dead Space dev team are giving gamers the opportunity to score some one-of-a-kind memorabilia, and help people in the process. As part of the ongoing efforts to help the people of Japan after the catastrophic earthquake last month, Visceral Games is auctioning off some unique, autographed Dead Space gear. The money raised will be donated in its entirety to the Red Cross' Japanese relief effort. Visceral's auction is made up of 37 lots, ranging from t-shirts of different sizes, to significantly rarer objects. 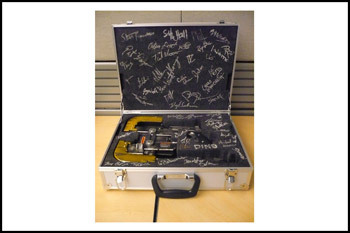 These hard-to-come-by items include a full-sized replica of Isaac's plasma cutter made by Epic Weapons, and the original script for Dead Space Extraction, the Wii prequel to the original game. Also up for grabs are collectors editions of Dead Space 2, action figures, and comics. All lots sport the autographs of the entire Dead Space dev team, meaning that you won't see their like elsewhere. At time of writing, the auction had a little bit less than six and a half days left. Despite the auction having only been live for a relatively short time however, every item on the list has had at least two bids, and in almost every case, a heck of a lot more. Anyone who wants the plasma cutter, for example, will need to beat $570 - and that's with nearly a week left to go. If you want to peruse the lots yourself, you can find them all here.